When a newspaper editor, Walter Burns (Cary Grant, The Philadelphia Story), finds out that his ex-wife, and ace reporter, Hildy Johnson (Rosalind Russell, Auntie Mame), is retiring to marry insurance agent, Bruce Baldwin (Ralph Bellamy, Trading Places), he uses every trick in book to destroy her plans. Here is one of those anomalies, something you don’t see everyday in Tinseltown: a remake that pulverizes the original. Director Howard Hawks (Bringing Up Baby) took the 1931 film The Front Page, which was an adaptation of the stage hit by Ben Hecht and Charles MacArthur, changed the gender of one of the main characters, and abracadabra, one of best romantic comedies of Hollywood’s Golden Era was born. 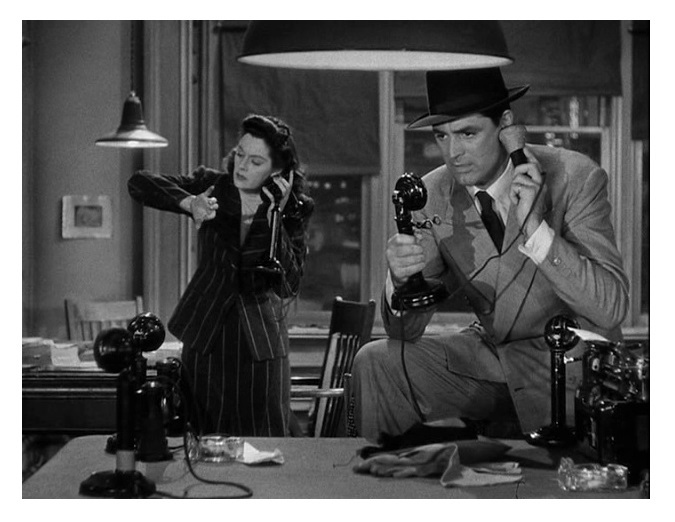 His Girl Friday‘s overlapping was ahead of its time. Characters talk super-fast, often interrupting each other, making some of what they say unintelligible. I had to replay certain scenes three or four times so I could hear what everybody was saying. Normally, this kind of thing is the kiss of death — last thing a movie wants to do is confuse the viewer — but I found myself bewitched by all that jumbled talk. Charles Lederer’s (The Thing from Another World) script is full of great lines: “The guy who looks like the actor Ralph Bellamy” and “The last man who said that to me was Archie Leach (Cary Grant’s real name! ), just a week before he cut his throat.” Hawks encouraged spontaneity and ad-libbing so a lot of what you see was improvised. 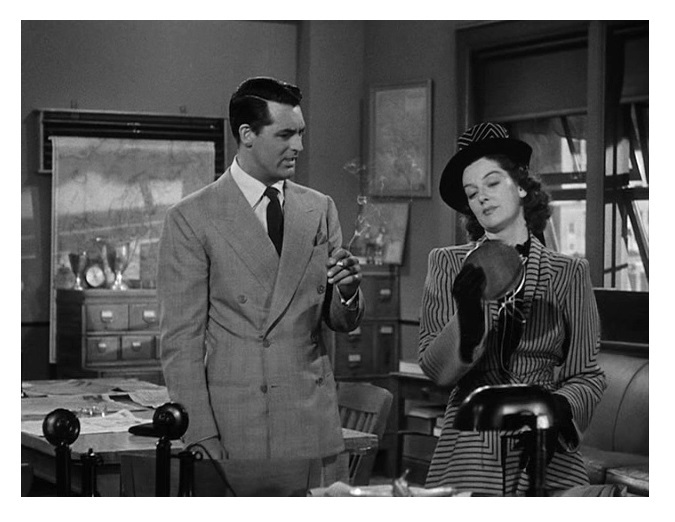 Also, I was very much taken aback by the His Girl Friday‘s forward-thinking attitude regarding gender roles. Russell’s Hildy is every bit the equal of the men; she is actually shown to be smarter than her male counterparts. And unlike George Stevens’s 1942 classic Woman of the Year, in which the main female character is literally sent back to the kitchen, Hildy’s talent is celebrated. Cary Grant and Rosalind Russell are superb — I just don’t know how they managed to talk so fast! They make an explosive screen duo. Ralph Bellamy has the least showy role, but he is very funny too. The great supporting cast includes Gene Lockhart (Algiers), and Porter Hall (Double Indemnity). 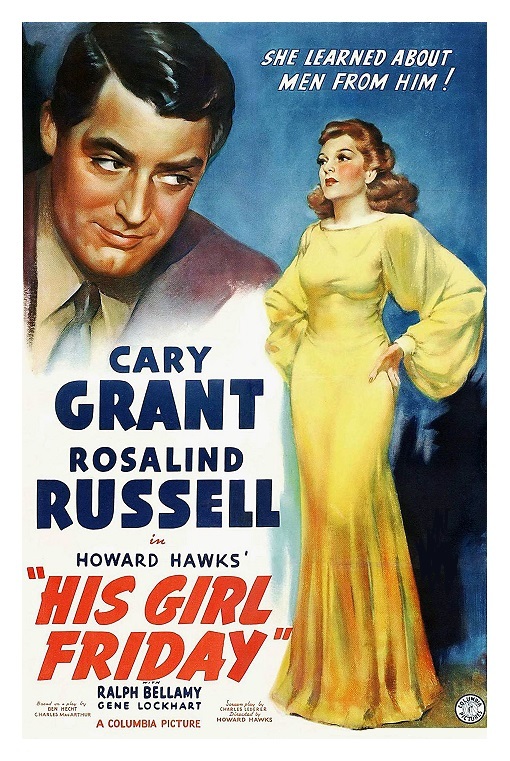 His Girl Friday is a lot of fun. However, you may need to keep the DVD player remote control close by so you don’t miss any dialogue. Remake in 1988 as Switching Channels, with Burt Reynolds, and Kathleen Turner. B&W, 92 minutes, Not Rated. This movie is a joy from start to finish. Glad to meet another fan! This film is a little jewel. One of my favorite. I love the rapid fire dialogue. I agree totally with your comment about portrayal of a professional woman — ahead of its time — but I disagree slightly with your take on the end of “Woman of the Year.” Yes, she goes back to the kitchen, but he tells her that’s not where she’s supposed to be. She needs to figure out how to be both wife and working woman, not give up one for the other. For the record, I’m not fond of that ending, I would have preferred a show-not-tell way of expressing that thought. I love your blog, by the way, I hope you know this comment is meant to be conversational and not confrontational! I don’t think any of the writers or key players in the film were happy with the ending. I’d read somewhere that the original ending had Tess covering a boxing match and Sam doing something similar for her, and they understood each other’s worlds much better after that. However, studio execs forced them to change it. But I’ve always liked the line (I’m paraphrasing), “you don’t have to be either Tess Harding or Mrs. Sam Craig. You have to figure out how to be Tess Harding Craig.” To me, it hits at the heart of what women are faced with everyday: not fading into a role of wife and mother, but expanding your role, re-shaping it so you remain true to yourself. I should re-watch it, too, to make sure I’m not projecting my own thoughts there, but I don’t think I am. Thank you for listening to my viewpoint! The ending did rub me the wrong way. I found Tracy’s character a bit smug too. But as I said before, I need to re-watch it. Thanks for your lengthy respond. It’s far from the best ending that film could have had. Not true to the characters. After I wrote my last response, I did a little research and found the original ending used the part I liked (“Tess Harding Craig”). So, I guess maybe my sunny side (ha) chose to focus on the value in the “lesser” ending. I would really like to see the original!!! !